Investors increasingly are looking outside traditional government bonds in order to generate acceptable yield in what is a historical low-yielding environment. 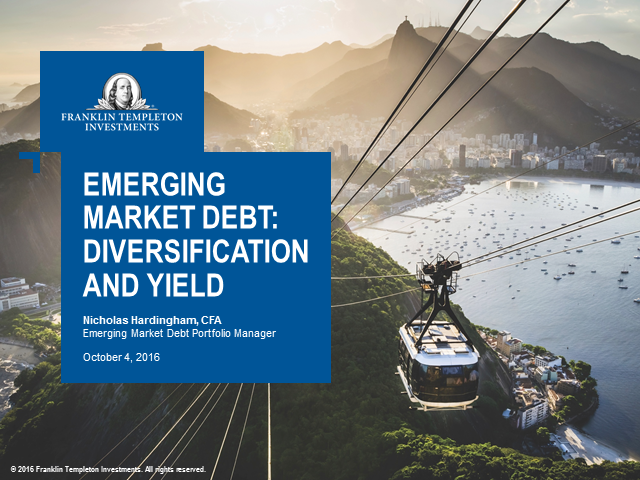 Emerging Market Debt (EMD) has been a significant beneficiary of this reallocation. In spite of this, yields for EMD remain significantly elevated in comparison to their developed market peers, and in line with their longer term historical averages. Much of this capital has been placed into more traditional EM issuers which in itself concentrates investors’ risks. Looking at benchmarks, the most consistent and superior long-term risk/reward outcomes in euro terms have tended to be generated by a blended allocation to hard currency, local currency and corporate EMD. Given the significant differences in correlation of hard, local and corporate EMD versus traditional fixed income, this active and blended approach could provide investors with diversification from core fixed income holdings whilst capturing the higher yields on offer.